News in overnight from Bob Cury at RJC Yachts that he's signed the 44.8m motor yacht Lady M for sale. Built to ABS class by Intermarine in 2002, she features a five stateroom layout with a large master suite on the main deck and four oversized staterooms below. A highly customised interior is finished in honey-glazed maple woodwork accented by gold and neutral tones. Twin Caterpillar 2250hp engines give Lady M a comfortable cruising speed of 16 knots and she was most recently refitted in 2011. The refit included a a new paint job at the Rybovich yard, a fresh interior and the latest in audio/visual equipment. 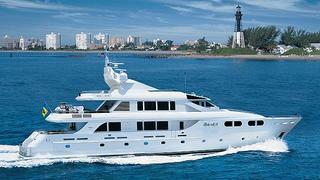 On display at the upcoming Fort Lauderdale Boat Show, Lady M is asking $11.9 million.